Plugsound Pro and the UVI Soundcards requires authorization to be operational. They are protected via the iLok copy protection system. The iLok Smart Key enables you to carry all of your authorizations with you wherever you go using a single key. It's portable, iLok enables you to easily move authorizations from one computer to another. Use your software at home, at the office, at a studio, or at a friend's house. Authorizations are stored in the safe, secure iLok - not on a computer or hard drive. 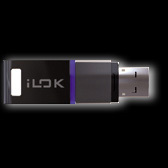 iLok is immune to problems caused by machine upgrades, disk maintenance, hardware failures, and software updates. UltimateSoundBank software uses the iLok system for authorizations. Authorizations can be added to the iLok USB key using an iLok License Card, a plastic card about the same size as a credit card, with a small punch-out GSM plastic chip. The chip is used to move authorizations to the iLok USB keys. The chip on the License Card contains the authorization license necessary to activate and run the software you purchased. Once iLok is authorized for a given piece of software, The user has the freedom to use the iLok to authorize that software on any computer. An iLok key is required and not included in UltimateSoundBank products. An iLok key is required and not included in UltimateSoundBank products.